These are the words of Lingyun Xiao, Researcher at Peking University, who, together with her team, received CLP funding in 2013 for their project researching the availability of snow leopard prey in China’s Sanjiangyuan Nature Reserve. The team recently submitted a preliminary report which contains exciting insights into what it is like to work in some of the most remote and rugged sites on earth. Their project started when they embarked on a trip with other collaborators to monitor blue sheep on the Tibetan Plateau. Blue sheep, which weigh up to 75kg and have massive horns – prized by game hunters – are a main prey species for snow leopards. The team surveyed blue sheep and livestock in seven sites each year in different seasons in order to help develop a conservation strategy. Besides doing their own survey, the team worked alongside local community members. They helped the locals to start three of their own wildlife monitoring teams: one focusing on blue sheep and the other two on snow leopards. Sanjiangyuan, located in Qinghai, on the edge of the Tibetan Plateau in China, is one of the most important areas for snow leopard conservation. Although the Sanjiangyuan National Nature Reserve covers a large portion of the area, local herders still live inside the reserve. 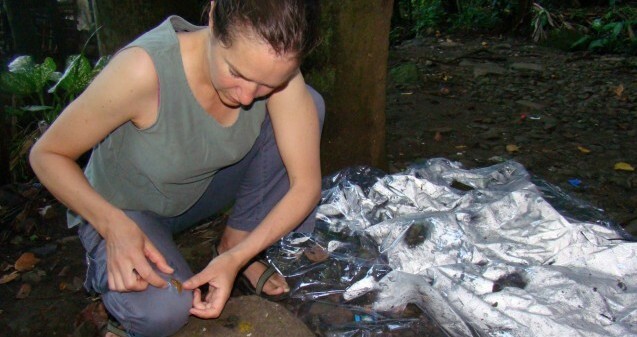 Based on previous successes in Yunta village, Lingyun Xiao tried to involve the local community in her camera-trap research. The team taught the community how a camera trap works and asked for their help to take care of the cameras, helping to build trust with people there. Apart from protecting their camera equipment, the team have found that a good relationship with local herders is important to ensure accurate data from their surveys. In April 2014 the team were lucky enough to spot a whole family of snow leopards, after braving the terrible winter weather in Soujia on the Tibetan Plateau. At the head of the Mekong River, Zaduo County, Qinghai, is located within the largest continuous snow leopard habitat in China. 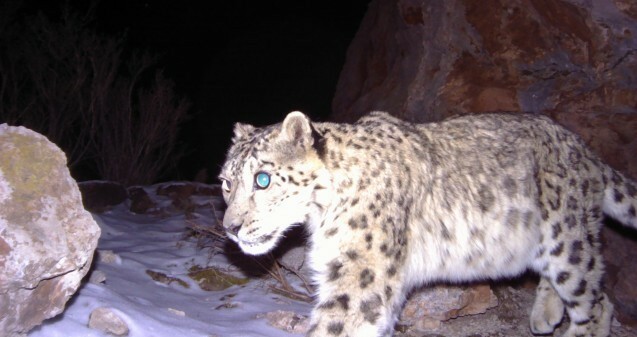 An established team of 20 local herders deployed 40 research cameras in the area as part of a four-day trap camera training course in May 2014, to monitor snow leopards in the area. The study was supported by Shanshui Conservation Center, Peking University and the local township government in the county. For the final stage of this CLP-funded project, the team will continue their field work, collecting camera trap data in early 2015 and analysing the impact of livestock on the populations of blue sheep. In the future Lingyun Xiao and her team plan to carry out more analysis across several seasons and the team hope to be able to establish the density of snow leopards across the region. Some extracts from Lingyun Xiao’s report have previously appeared in an article published by the Snow Leopard Trust. Image credits: Snow leopard, Lingyun Xiao; Surveying blue sheep, Lingyun Xiao; Researchers and community members, Dawa Jiangcai; Snow leopard cubs in den, Edward Zhu.